Western Specialty Contractors has acquired the assets of full-service, commercial roofing and sheet metal contractor Great Plains Roofing and Sheet Metal of Kansas City, KS. The acquisition will expand Western’s existing roofing business in the Kansas City area and provide Western’s customers with a more comprehensive range of roofing, concrete, masonry and waterproofing services. “The acquisition of Great Plains expands our roofing services in Kansas City and broadens our customer base. 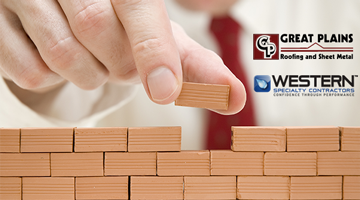 Customers benefit from ‘one-stop-shopping’ for all their building envelope needs that the combined companies provide. Western and Great Plains both have long track records of success and share a passion for forming long-term partnerships with their customers – traits that are beneficial to everyone involved,” said Western Specialty Contractors COO Tom Brooks. Between 60-70 skilled tradespeople and several office personnel at Great Plains Roofing will join Western with the acquisition. Great Plains owners Jay Harrington and Kevin Scanlon have agreed to stay on throughout the transition process to ensure a smooth and seamless transition with the operations of the company and their customer base. Once the transition is complete, both owners plan to retire. Established in 2004, Great Plains offers a number of roof systems to meet various requirements, including: mechanically fastened and adhered TPO roof systems; mechanically fastened, adhered and ballasted EPDM rubber roof systems; modified bitumen hot and cold applied roof systems; built-up asphalt surfaced and gravel surfaced roof systems; and standing seam metal roof systems. In addition to new and remedial roofing, Great Plains also offers an in-house sheet metal fabrication facility capable of complex projects in a wide variety of sheet metal materials that works in conjunction with a team of seasoned installers. To wrap up the full-service roofing support, Great Plains also provides 24-hour emergency repair services. 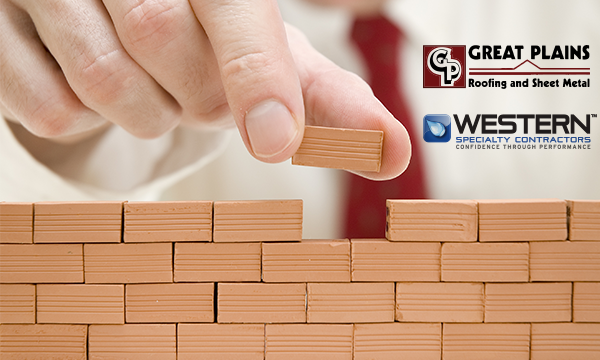 Leaders for each of Great Plains’ business units (roofing, sheet metal and repair) will report to Western Specialty Contractors Region Manager Bob Gender. Western Specialty Contractors also has a Kansas City Branch Office, established in 1945, that provides concrete and masonry restoration, epoxy and chemical grout injection, expansion joint systems, exterior wall coatings, parking and plaza deck restoration, and waterproofing.